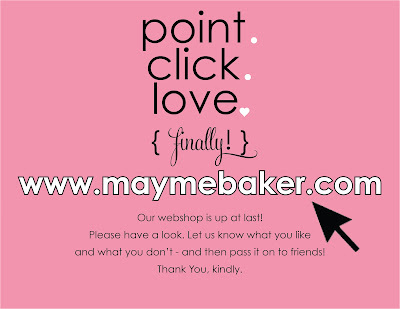 Viewing posts tagged shop mayme baker. As we begin a spanking new year full of sparkly promise and possibility, thought I'd share some of the holiday fun that went down in my household this Christmas. I always dreamed if I were ever lucky enough to have a daughter, she would have an annual holiday tea party to celebrate her, girlhood and the season, of course...and I decided the day after Thanksgiving that 2013 would be our inaugural year! Even though I did wait until the last minute to order the invites and throw it together, it was more than great fun and we made some sweet memories! For decor, I gathered mismatched teacups and cake stands and all things vintage and pretty to build a magical tablescape complete with mini marshmallow "snow." The theme was based on the circa 1897 story of eight-year-old Virginia O'Hanlon who wrote a letter to the editor of New York's Sun in an effort to determine if Santa Claus really existed. Veteran newsman Francis Church quickly responded to her query with what has become the most reprinted editorial in newspaper history. His bright words of wisdom and truth bring as much hope and glee to the world today as they must have to that discouraged little girl way back when. My girl Virginia gets extra excited at the thought of any kind of party or fanciness...especially if it involves dressing up and the fare includes, and is pretty much limited to, sugar + more sugar + simple processed carbohydrates. The fabulous Newport Cookie Company in Newport, RI created unbelievable custom teacup and Santa cookies for me...the teacups actually had teabag strings and tags inserted into the icing...adorable! And my kind friends at Table 301 rounded the menu out with peanut butter-honey finger sandwiches, cucumber dill tea sandwiches, fruit kabobs and fried mac-n-cheese bites (this is the south, y'all). Virginia loved the idea of being "hostess" to her school and neighborhood friends (we've been talking about what being a hostess vs. a guest means...and how those roles are very different!). Let's say it's a work in progress...but she was delighted to greet her visitors at the door and welcome them into her home. After some tea, hot cocoa and treats, our beautiful friend, Susan Edwards Willis not only captured some great photos throughout the day but took a break to read the Yes, Virginia book to us in her best New York accent. My Virginia even blurted out from memory, "If you see it in The Sun, it's so!" I love this image with the nativity...that's my precious niece, Mayme who took a little while to warm up. Whaaaaat?! Believe it, babygirl! He's as real as real can be! So, here's to believing... and a glowy, wonder-filled, tip-top 2014! Cheers! We are right on the doorstep of some noteworthy developments here at Mayme Baker Studio! First, our downtown Greenville design studio is now open by appointment only. Many of you have stopped by and wondered why the door was locked, only to read the sign and realize the inevitable: we are in transition! Lest you worry that you might not have easy access to the studio treasures anymore, let us assure you that we have a plan to take your boutique shopping experience to a higher level! Maymebakerstudio.com has been completely re-designed into a user-friendly dream! We’re busy hunting down new and special things to add to our ever-growing online collections. So, with the click of your mouse, you’re virtually here in our studio! Anytime, anywhere! Everyone is invited to our virtual soiree to celebrate! And everyone receives a party favor: 20% off everything in our fabulous new web boutique! Use code LAUNCHPARTY at checkout until August 22nd. Of course, if you need an item immediately, we would welcome your call, or you can stop by our booth at Antiques on Augusta which is full of many of the same gems that you will discover online. Let us know what you think and how we can better serve you! Cheers! Go HERE! Shop 'til you drop!